It's a simple way to calculate the date based on the daily difference without having to start ergo run Excel! 1.) ... How do I use the date-calculating from the daytime difference! 2.) ... Based on a proposal from an Excel user! Tip: ►► .... Working with date and time in QTP! 1.) How do I use the date-calculating from the daytime difference! Just enter the day difference for example -1000 days and you can see what day it was 1000 days ago. Or as here in the example 21 days to see what kind of day it is exactly after the expiration of the 3 weeks deadline. (Image-1) Why the days in the left area to the date difference output? Often you want to calculate a date in the future, such as in a goods order, appointment or other where applies. In Excel this is very easy to realize because not everyone has Excel or does not want to start it for this simple task each time, and is not so good at date-calculating has found the simplest solution with Desktop.Calendar.Tray.OK. 2.) Based on a proposal from an Excel user! Created on a suggestion, after the possibility such a function, as the attached picture shows Calculate the date by adding or reducing days from today. It's very easy in MS EXCEL, but the user does not want to open Excel every time this desktop calendar has the same function. (Picture-2) Excel Tabe Day Calculate Day Difference Let! As you can see above in Windows 10 shot screenshot, the elegant solution is written not only for Windows 10 to calculate from the daily difference the date in the right pane next to the date difference input. However, you can easily use this solution on earlier or older versions of Microsoft's Windows operating systems, whether it's a Windows desktop, tablet, Surface Pro / Go, or even a server operating system. It has been tested on all and successfully verified. 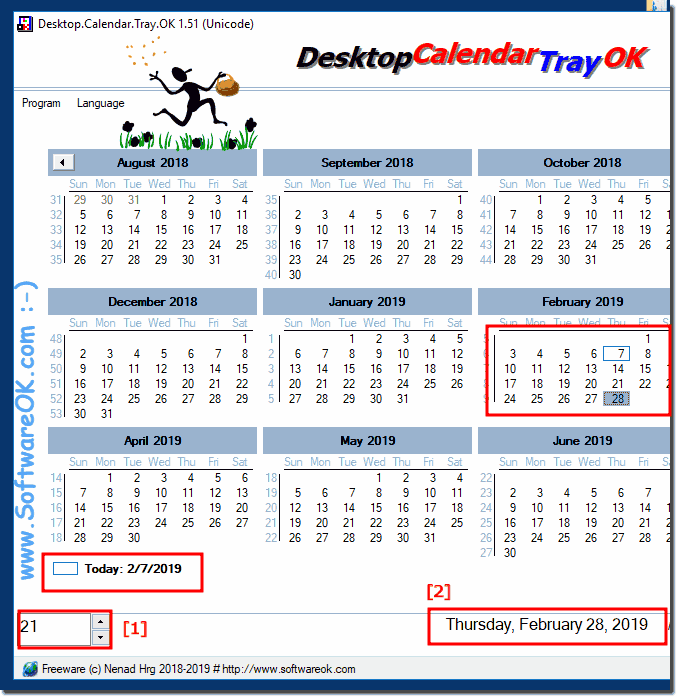 Desktop.Calendar.Tray.OK - FAQ-5: Why the days in the left area to the date difference output?